The monument has two wings spreading on four floors, each with a staircase and a central hall that connects the two bodies on the second level. The monument has two wings spreading on four floors, each with a staircase and a central hall that connects the two bodies on the second level. The two lateral rooms on each level, originally symmetrical on all floors, have been modified during the Jubilee Year in 2000, with the inclusion of a lift on one side, eliminating all architectural barriers. Inside the monument retains its original shape. Porta San Pancrazio is one of the south gates piercing the Aurelian walls, and nearby basilica dedicated to the Christian martyr. Rebuilt in 1642 over the perimeter of the new Janiculum walls commissioned by Pope Urban VIII Barberini for the defence of the Roman Republic of 1849, it was irreparably damaged by French cannons. 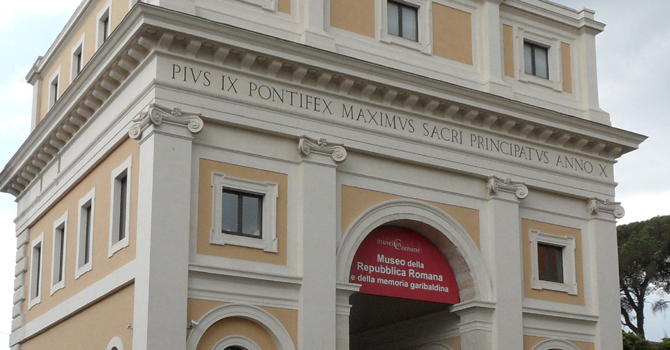 Upon his return to power, Pius IX commissioned the reconstruction to Virginio Vespignani (1854-57). The gate was restored for the Jubilee of 2000.